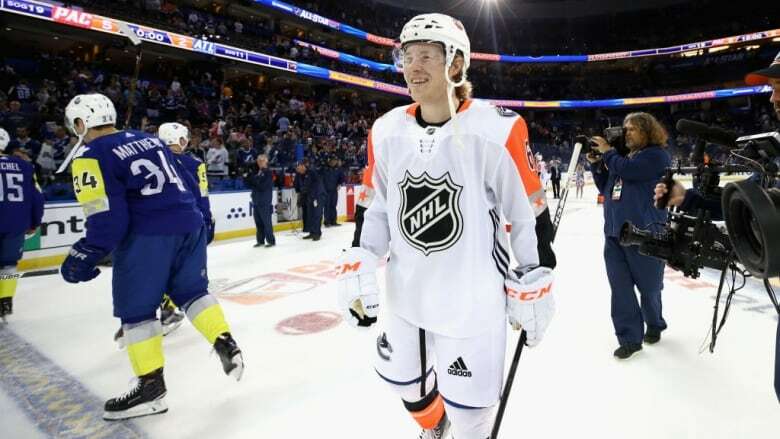 Vancouver's Brock Boeser was more than happy to just be at the NHL All-Star game, mingling with some of the high-profile players he grew up admiring. "Shocked," the 20-year-old said Canucks star said, describing his reaction. "I never would have dreamt this any time in life." The NHL's leading rookie scorer with 24 goals and 19 assists for the Canucks also had a helper in the final after scoring to put his team ahead for good in the Pacific's 5-2 semifinal victory over the Central Division. "I was definitely nervous coming into it," said Boeser, the only rookie among 15 first-time all-stars. "[I said] enjoy this, just have fun, smile. That's what I did." Goalies Marc-Andre Fleury and Mike Smith teamed to allow just four goals in the two games the Pacific won to claim the $1 million US winner-take-all prize. Tampa Bay's Nikita Kucherov had three goals in the Atlantic's 7-4 semifinal win over the Metropolitan Division, however the Lightning's young star was shut out in the championship game. "After we saw that we won the first game, we said we needed to tighten up a little bit and play a little harder there for the cash," said Gaudreau, who plays for the Calgary Flames. "We made sure we were ready to go. [Because] now there's something to play for in the finals," said Smith, who stopped six of seven shots in the second half. "Our guys did a good job to up the tempo." Adding spice and a unique flavour to the experience was Tampa's annual Gasparilla Pirate Invasion, which drew what officials estimated as an additional 200,000 people to the downtown waterfront for a parade and other activities. "Tampa proved it's a great hockey town," said Lightning first-time all-star Brayden Point, added to the game because of an injury to Tampa Bay defenceman Victor Hedman. "It's awesome." With the Lightning's Jon Cooper coaching the Atlantic Division, and the team with the NHL's best record represented by a league-high four players, the sellout crowd of 19,092 roared its approval when the Atlantic-Metropolitan semifinal began with goalie Andrei Vasilevskiy, plus Kucherov, Point and Steven Stamkos on the ice at the same time. 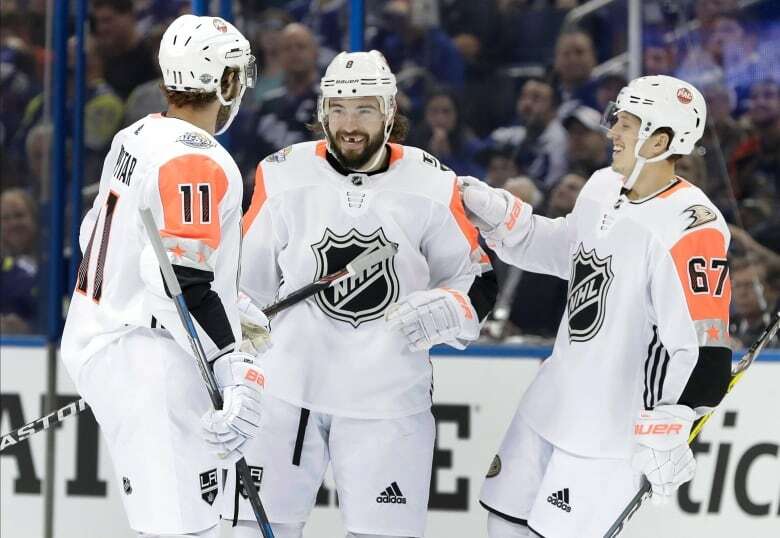 Kucherov's hat trick in the Atlantic's semifinal win was the first for an All-Star game since the NHL instituted the three-match, three-on-three tournament format. "He's a magical player," Cooper of the 24-year-old two-time All-Star who's among the league's leading scorers.